Lingbi rocks are found in Lingbi county of Anhui province. They are fine-grained, delicately textured limestone and lie deep in the red mud of the Qingshi mountains. Naturally shaped, they need no cutting or carving. Depleted after generations of mining, high quality Lingbi are now quite rare. They are hard and an ordinary knife cannot cut them. Their mineral composition is such that they produce a metallic, resonant sound when tapped. Hence they are also called "resonant rocks"(bayinshi). They were sometimes used for making chimes and are thus also known as "chime rocks". During the Hongwu era of the Ming dynasty, the emperor had rock chimes produced for donation to Buddhist temples throughout the country. Lingbi rocks are beautiful and clear-cut, with a frame of soft lines. Combining masculine beauty with antique simplicity, they have been admired by connoisseurs for centuries. In the Northern Song dynasty, Emperor Huizong wrote this inscription on one Lingbi in this collection: "The mountain is high while the moon looks small, the water ebbs and the rock juts forth." Historically, because this type was so difficult to find, people sometimes dyed others rocks to pass them off as Lingbi. 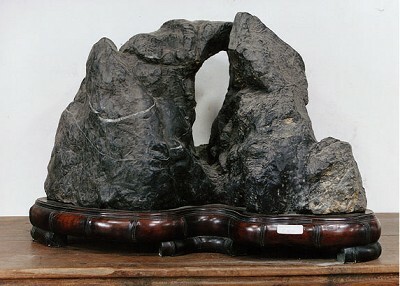 Most true Lingbi rocks are dark gray and black although some possess undercurrents of white, red, brown or are multi-colored (wucai).